With the 2012 Major League Baseball draft less than one week away there is much talk all over baseball and the internet about the upcoming draft. One of the potential top five picks that has been getting a lot of buzz from the national writers and publications is LSU Pitcher Kevin Gausman. While Gausman is close to turning to page to the next chapter of his baseball career he still has a few paragraphs to write with the LSU Tigers. Playing at Grandview High School in Colorado, Gausman’s career started to take off during his junior and senior seasons. As a junior the right hander went 7-2 with a 2.15 ERA while striking out 71 batters over 48 innings. He followed that up with a 9-2 season his senior year, striking out 88 and finishing the season with a 3.12 ERA. These fantastic numbers earned Gausman numerous accolades including being named a two-time All-State and a two-time Perfect Game All-American selection. Besides those honors he was also named to the AFLAC All-American team and was also a member of the USA Baseball Junior National Team which won a gold medal. As his high school career came to a close Gausman had committed to playing baseball for the LSU Tigers, one of the top baseball schools in the country. There was also a buzz among scouts that he could be a high draft pick. The draft however came and went and the righty was not taken in the first few rounds. He did get selected however in the 6th round by the Los Angeles Dodgers. The Dodgers hoped that they could work out a deal in the summer and get a potential draft steal. That deal never happened however as he had a strong commitment to playing a big role on the LSU Baseball Team. As a freshman Gausman had hoped to play a big role right from the start and he just did that. Over the course of his freshman season he started 14 games, posting a 5-6 mark and a 3.51 ERA in 89.2 innings with 86 strikeouts. While those numbers seem mediocre Gausman was a starting pitcher as a freshman in one of the best baseball conferences around. To end the season Gausman finished with a 3-1 record with 1.17 ERA in his final four starts while averaging over one strike out per inning pitched. Gausman was able to carry his strong finish and turn it into a strong start to his sophomore year. In 15 starts for the Tigers this season Gausman has been stellar going 10-1 with a 2.84 ERA holding opposing batters to a .231 batting average. The right hander also continued to put up solid strikeout numbers totalling 125 in 107 2/3 innings. The Tigers finished the regular season as champions of the SEC conference. Just this week Gausman along with LSU teammate, outfielder Raph Rhymes were nominated as semifinalists for the 2012 USA Baseball Golden Spikes Award. One of the top accolades for any college baseball player. Gausman and his LSU teammates now are set to open play in the NCAA Regionals and march their way to the College World Series. Gausman will have plenty going on with the Regionals in full swing next week when the 2012 Major League Draft gets underway. Gausman is projected by most of the top draft experts in the game to go in the first five picks. The majority of these experts have him pegged at #4 overall with the Baltimore Orioles but some have him going as high as #2 to the Minnesota Twins. The team that is lucky enough to select Gausman will be receiving a pitcher with a power fastball to go along with a rapidly developing split-change. The righty also throws a curveball and a slider that are in need of further development. With his continued development Gausman could march fast through the minors and reach the majors in a relatively short time frame. Who will draft Gausman? 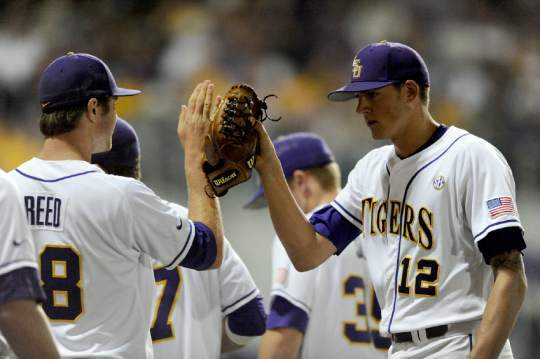 Will the LSU Tigers be College World Series champions? Will he sign early enough to make an impact in the minors this season? Those are all questions that will be answering in the coming days, weeks and months. We will keep you covered on all these events here at Chasing MLB Dreams. For those who don’t know much about you, tell us a little bit about yourself – what your throw and what you bring each time you take the mound? For those that don’t know me I am a sophomore RHP at LSU. I throw a four-seam FB and a one-seam sinking FB. I also throw a split-change, curve ball and slider. I take a lot of energy with me when I take the mound and I love to compete. LSU just won the SEC regular season championship – What was that experience like for you? It has been a great experience this season. I love my coaches and teammates and I feel that when you have a team as close-knit as we are, it that much more fun when you have success. Being draft eligible for the 2012 MLB draft and being watched by scouts from around baseball do you feel any additional pressure when there are people analyzing every pitch? I know that people are analyzing every pitch, but I have learned to just put that out of my mind and play my game. I don’t have to be anything more than who I am, so I try to compete and win games for my team. The rest will work itself out. Being just a few days away from the draft do you consider draft talk to be exciting or something that is more distracting from your current goals with the Tigers? I don’t pay attention to the draft talk. No one knows what will happen on draft day so it kinda doesn’t matter at all what people are predicting. A lot of things are still to be determined. With NCAA Regionals set to begin, what has been your top moment of the 2012 baseball season? My top moment would have to be the first SEC start I had this year. It was against Mississippi State and was an absolute pitchers duel. Stratton for Miss State pitched very well, as did I and it was so much fun to be part of. Besides playing at a great college, you have also had the opportunity to represent Team-USA. Any particular moment stand out from that experience? Really the entire experience of playing for Team USA was unbelievable. Putting on those stars and strips and representing the greatest country in the world is something very special. It is a great feeling playing for your country and just making the team was such an honor. Best thing about playing at LSU? Best thing about playing at LSU is the rich baseball tradition and having the greatest fans in college baseball. Any particular song or songs you listen to before a start?